Yes. You are entitled to email support for one year after purchase of your TeacherStick. Please use the Support Ticket system if you need help. How much memory does a TeacherStick have? The standard TeacherStick has 8Gb of memory but some of this is taken up by the programs and operating system on the TeacherStick. There is more than 7Gb of free memory left for you to store files of your own. In the UK we use Royal Mail First Class as our standard delivery method. If you order before 4pm on a working day you should normally receive your TeacherStick the next working day. There are other delivery options available which are listed at the checkout. How easy is it to set up the TeacherStick? It is very easy because there is nothing to set up. You just plug it into the USB port of any Windows computer and that’s it! What is Contained on TeacherStick? 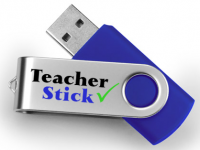 All of the latest content on the TeacherStick is detailed on the page where you purchase your TeacherStick. Please check this so that you know what you are purchasing.